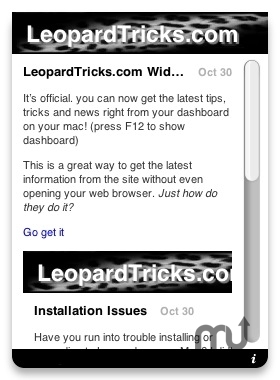 A news feed widget for LeopardTricks.com. Is there a better alternative to Leopard Tricks? Is Leopard Tricks really the best app in Card and Board category? Will Leopard Tricks work good on macOS 10.13.4? Leopard Tricks widget displays an RSS feed of the popular leopardtricks.com website. Leopard Tricks provides tips, tricks and news on Apple's latest operating system, Mac OS X 10.5 'Leopard'. Leopard Tricks needs a review. Be the first to review this app and get the discussion started! Leopard Tricks needs a rating. Be the first to rate this app and get the discussion started!